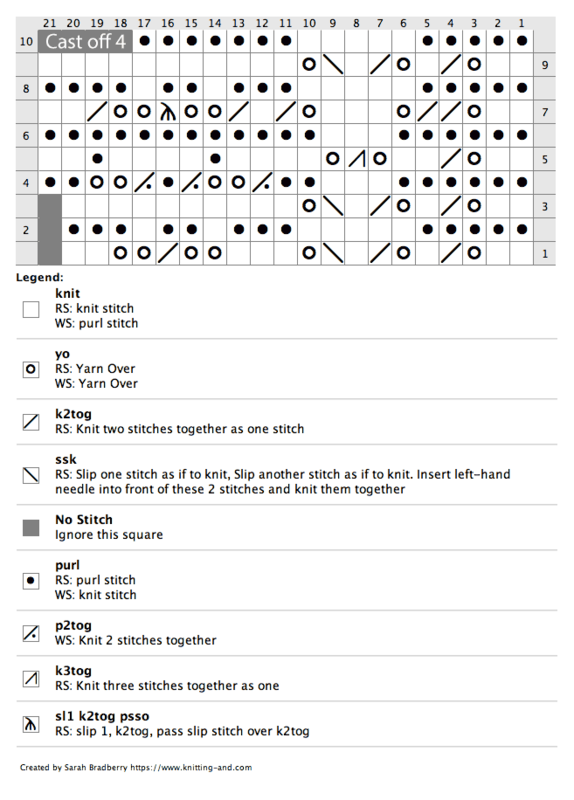 The instructions below have been updated for modern knitters, checked for accuracy and test knit. Cast on 17 sts and knit one row. Row 1 (RS): K2, [yo, k2tog, k1] twice, ssk, yo, k3, [yo] twice, k2tog, [yo] twice , k2 (20 sts). Row 2: K3, p1, k2, p1, k3, p5, k5. Row 3: K2, [yo, k2tog, k1] twice, ssk, yo, k10. Row 4: K2, [yo] twice , k2tog, k1, k2tog, [yo] twice, k2tog, k2, p3, k6 (21 sts). Row 5: K2, yo, k2tog, k2, yo, k3tog, yo, [k4, p1] twice, k2. Row 6: K12, p3, k6. Row 7: K2, yo, [k2tog] twice, yo, k3, yo, k2tog, k1, k2tog, [yo] twice , sl1-k2tog-psso, [yo] twice , k2tog, k2. Row 8: K4, p1, k2, p1, k3, p5, k5. Row 9: K2, [yo, k2tog, k1] twice, ssk, yo, k11. Row 10: BO 4 sts, k6, p5, k5 (17 sts). 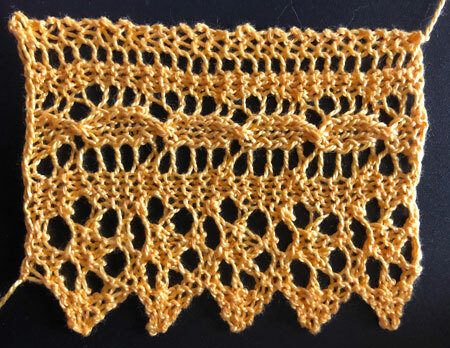 Cast on 17 sts and knit one row. Commence from row 1 of the chart.